Love their brains and want a clever way to tell them? Know they're overzealous about anything zombie related? 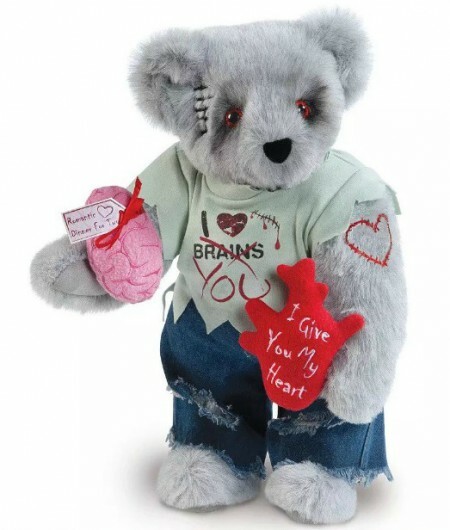 Surprise them with the Zombie Love Bear! He's frightfully endearing with gray fur, red eyes, a facial scar, razor-heart tattoo, tattered jeans and screen-printed tee. Accessorized with a felt brain tagged "Romantic Dinner for Two" and a stuffed heart that can be personalized with a name on back. Makes a great gift for your ghoul-friend! Handmade in Vermont, USA using the softest fur we can get our paws on and 100% recycled stuffing. Guaranteed for life.